But I wonder, how many of the 28% who got it wrong rejected (E) because they've been taught to avoid the passive voice? In teaching undergraduate Introduction to Linguistics, I find that nearly all students educated in the U.S. report having gotten anti-passive instruction from an authoritative source. Only about 10% have also been taught to identify passive-voice sentences accurately; but in this case, option (A) supplies an agent in subject position, which is one of the factors causing confusion. I was curious to learn what the College Board would take to be the right answer in this case. It's clearly not (C) or (D), which lack a main verb; or (B), where the subject is plural and the verb is singular, and the by-phrase ("by which flowers from which the nectar is taken") is ungrammatical. Out of context, (E) is the best choice for formal writing — but it has two passive-voice verbs, while (A) has only one! Bees do not use coloring or flavoring agents. They determine the color and flavor of honey by the flowers from which the nectar is taken. So if you thought that the passive voice is to be avoided wherever possible — or if you thought that the College Board might think this, since your teachers have cited George Orwell and Strunk & White in warning against the passive — you might decide to choose option (A). As we've noted in the past, SAT questions like this one often too often turn into a judgment about the linguistic ideology of the College Board, rather than a judgment about English grammar and style ("Menand's acumen deserts him", 10/5/2003; "The SAT fails a grammar test", 1/31/2005). put the target sentence in context. In the overall instructions for the section on grammar and usage, explicitly list any "Zombie Rules" that you do not expect test-takers to accept blindly. Update — I agree with the various commenters who observe that the "they" in (A) is problematic if it refers to bees, since it implicates inappropriate conscious intention, in addition to being a bad idea in any case without justification from prior context. But someone who believes that reducing the number of passive verbs is a paramount goal — or who believes that Usage Authorities believe this — might still choose (A). Wow. I'm surprised that you don't discuss what seems to me to be the much bigger problem with the question: the underlined phrase has a different meaning than the alternatives. The College Board claim that "they" is unnecessary, but it's certainly not unnecessary if it makes a factual distinction! I would have chosen A simply because the question of better/worse constructed sentences is trumped by meaning. "They" indicate someone who "determines", which is a different use and meaning of determine than "determined by which/those/the flowers". The former usage indicates discovery. The latter usage indicates causality. Those usages are completely distinct. Perhaps the problem here is the notion that multiple-choice tests are a useful way to test knowledge. Why not, instead, ask the candidate to write a few sentences discussing the possible alternatives? Or at least, where the Board has asked an ambiguous question, the candidate could be given the option of explaining why they had chosen a particular answer. True, this would take more time to mark and cost more, but so what, if it would be fairer to candidates? Assuming such a rethink is unlikely, though, your concrete suggestions seem to be good ones. I prefer the "ignore the following zombie rules" variant of rule 1. Reading your discussion more carefully, I see your imagined context. That seems like an odd use of determine–but obviously valid and distinct from the two I describe. A sort of combination of causation and choice (like "decides"). In either case, they as "people" or "scientists" is crucial to the meaning of the phrase…just as it is in your example of "bees". I just cannot see how A and E can be claimed to be equivalent in meaning. A and E aren't equivalent in meaning, which I think is the point – E means something that is considerably more likely to be true than A, to the point that if someone says A it's a decent bet that they meant E. You need to see what they mean to determine which one is right! Agree. The actual active counterpart to E, assuming it's supposed to mean something plausible, is "The flowers from which the nectar is taken determine the color and flavor of honey." You could of course rephrase it perfectly well with an active main verb, if you weren't constrained by the choices available and the location fixed for them: "The flowers from which the nectar is taken determine the colour and flavour of the honey." But, yes, 'they' in the original is very weird, I agree. It just couldn't possibly mean the same thing as option 'E' does: 'E' is therefore not exactly what I'd call 'another way of phrasing the underlined material'. 'X determines Y' ='Y is determined by X'. But in 'They determine Y by X', 'They' can't refer to 'X'. 'They' has to be someone or something else. And I don't think people or scientists or bees determine the colour and flavour of honey by the flowers from which the nectar is taken. In one sense of 'determine', the flowers determine those things. And in the other sense of 'determine', people or scientists or bees determine them by looking at and tasting the honey. Dawdling with the comment window open for too long without refreshing the comments – didn't mean to repeat what you said, army1987. The question is flawed. It has what is called in the testing business a "double key." The original sentence is quite well formed and would fit perfectly into a context like the one Keith M Ellis imagines. The College Board's claim that the pronoun "they" is "unnecessary" betrays a woeful lack of grammatical understanding: as subject of the sentence's main clause, the pronoun is syntactically indispensable. That the College Board routinely subjects kids to questions like this is a national disgrace. "In the overall instructions for the section on grammar and usage, explicitly list any "Zombie Rules" that you do not expect test-takers to accept blindly." But why should they *list* these rules when they can instead have this knowledge passed on only to those students wealthy enough to afford test prep! C'mon people, class hierarchies don't perpetuate themselves! Out of context, the testee is left guessing the board's intent. I would prefer a sentence prior to the one in question that establishes a context in which a passive would be unambiguously correct. Something focusing on the honey itself would do. You wrote "SAT questions like this one often too often turn into a judgment about the linguistic ideology of the College Board," but I think you're being a bit too hard on the test here. I teach SAT preparation and on the whole, the test is generally quite good about avoiding Zombie Rules and most questions are uncontroversial. I would think that you would be pleased that the College Board is teaching students that passive voice can be perfectly acceptable, which it does regularly. It is true that students who are reflexively anti-passive would likely get this wrong. But isn't that a good thing? Those students ARE wrong! Those who are arguing for the acceptability of choice A are doing so by coming up with other contexts in which A might be acceptable. But questions like this are intended to be stand-alone sentences, not part of a larger passage. In this sentence, without having any other context, choice E is clearly better than A, since there is no possible antecedent for "they" within the sentence. This is a non-trivial point: being able to analyze a sentence on its own merits is a somewhat different skill than analyzing a sentence in the context of a larger passage. In fact there is a different section on the SAT Writing called "Improving Paragraphs" that does the latter, in which you are asked about sentences in the context of a two- or three-paragraph essay. I will concede that those who write explanations of questions do a much poorer job than those who write the actual questions. Commenter Tom Saylor is right that "they" is not "unnecessary" in that you can't just delete it, since it's the subject of the sentence in choice A. But what they meant to say is that you shouldn't use the pronoun "they" as the subject in this context, and that you should use a different subject, as choice E does. [(myl) I question whether it makes sense to test (many aspects of) usage on "stand-alone sentences, not part of a larger passage". Many choices among grammatical alternatives depend precisely on how the sentence fits into a larger passage; and test-takers are likely to imagine contexts for decontextualized examples, in an uncontrolled way that will add statistical noise to the test results. But my post mainly addressed a different question: because many students have been exposed to ill-founded "rules" that often make little sense as presented — prescriptions against clause-final prepositions or sentence-initial conjunctions, for example — some of them will assume that an authority testing them on English usage expects them to apply these "rules", even when the results are otherwise odd, awkward, or unnatural. (And the point is not that getting the right answer depends on applying such Zombie Rules, it's that getting the right answer depends on ignoring them.) Again, the result is unwanted statistical noise added to the testing results. Out of context, the testee is left guessing the board's intent. That's why it's much easier to get a perfect score on the math section. All in all, though, if the only questions you have trouble with are the ones with this sort of judgment call, you're probably still going to score in the 95th percentile or above. So it's not actually all that crucial to be able to divine the intent of the test-writers. Just ruling out the obviously bad answers will put your score above the scores of people who don't know enough to make it obvious that those are bad answers. "Honey's color and flavor" is plural? That's if you think of it as shorthand for: Honey's color and honey's flavor. But as Honey's (color and flavor) it looks quite singular, at least to people who think Funk and Wagnall's is a dictionary. The original sentence seems wrong to me for a different reason. I don't think you can say NOUN PHRASE determine(s) NOUN PHRASE by NOUN PHRASE. Instead I would say NOUN PHRASE determine(s) NOUN PHRASE by VERBing (something) as in "They determine the color and flavor of honey by examining the flowers from which the nectar is taken"
The use of the passive voice has long been a cliche in scientific papers, so it isn't surprising that the College Board would treat it as "good usage" here. Occasionally, you'll find a paper written in the first person active voice, but that's pretty uncommon. "They" in answer A is a dummy subject of a sort. That is, it has no referent. Meaning-wise, it's equivalent to a passive with the agent not stated. And it's stylistically much better in such instances to use the passive, thus E being the correct answer, though A and E are both grammatical. A can mean other things, but it can also mean the same as E, and, given the lack of context, that's how I took it, and apparently that's how it's meant to be taken. How practical, though, would listing zombie rules be? That would be a long list to put on a test. The College Board's own preparation material does explicitly state that it expects students to recognize that the passive voice may be the most appropriate choice in some circumstances. Even though that point isn't exactly parallel, since it talks about correcting dangling modifiers, the general advice (passive can be ok) is relevant. So how much of a burden does the SAT have to explicitly correct bad grammar teaching? There's so much of it out there that I'm afraid it would be a Sisyphean task. [(myl) I should have checked the preparation material — thanks for doing so. That's a good place to put the caveats that I have in mind. @chris: I'm not sure why you would think that "it's much easier to get a perfect score on the math section." As far as I can tell it is equally difficult to get a perfect score on all three sections, but I don't have any data at hand. @myl: On the context issue, I'm no statistician so judging construct validity is outside my ability, but if you're interested in the effects of context, you could compare the SAT to the ACT. The ACT's grammar section (called the "English Test") is entirely contextual. Students are given 5 essays with 15 questions each. I should note, however, that the material tested isn't quite the same: the ACT tests punctuation and rhetorical strategies while the SAT focuses more on syntax and traditional "grammar". On the passive issue, I think the test does generally try to avoid including issues involving zombie rules. I've never seen a correct answer that involves a split infinitive or ends in a preposition (but I've never seen a wrong answer that does, either). But this question seems acceptable even within the context of the advice literature. Most such books say something along the lines of "avoid passive unless it's necessary". This would be a case where it's necessary. I think Strunk and White themselves would be fine with choice E here. I also think you overstate the extent of the problem with ignorance of passive voice. Anecdotally, I have not had many students who have heard about the proscription. I have encountered some, but I've encountered far more who have never heard the word "passive". (I've probably had more students who don't know what a verb is than who are anti-passive). So my guess is that the percentage of students who would actually avoid E because of this rule is negligible. But I'm not sure how we would actually measure this. @Ellen K.: I've always understood they with no antecedent to have a generic human referent (semantically akin to someone or people), and there's no human agent, no matter how vague, who can be identified in sentence E with its most plausible interpretation. Yeah, I'm with army1987 on that. Another agreement with army1987's interpretation. It requires too much contortion and second-guessing to choose any answer other than (E). Of the two grammatical choices, A and E, the “right” answer depends largely on whether determine has the sense of “figure out” (requiring a thinking agent) or has the sense of “cause to come about” (by some law or process of nature, absent an agent). Given the basic scientific facts, the first sense is considerably less plausible. In most situations, a thinking agent would figure out the color and flavor of honey by looking at and tasting or smelling the honey. A they figuring out the color and taste from the floral source instead would be unusual. Plausible examples I can think of are contrived: blind, ageusic agents (reading Braille jar labels? ), or cooks’s assistants required to order or choose honey they can’t see. Wait, I read army1987 as agreeing with my claim that E simply cannot have the same meaning as A because they in A is not a "dummy" subject, but refers to some "generic human referent". But E cannot be read in any way that includes that generic human referent. "A they figuring out the color and taste from the floral source instead would be unusual." No, I disagree. Indeed, imagine the first scientists to examine honey production. Eventually they would formulate a theory that…wait for it…determines color and flavor from the floral sources. The scientists themselves might write sentence E. Someone reporting the work of the scientists might write sentence A. The two sentences are not semantically identical. They just aren't. It requires too much contortion and second-guessing to choose any answer other than (E). No, you're making an unwarranted assumption. It takes too much contortion and second-guessing for you to choose any answer other than E. I didn't contort or second-guess at all. Keep in mind that the College Board included the original phrase as one of the answers, explicitly instructing the test-taker to choose A if they believe that the original phrasing is the best sentence. Well, if all choices other than A either are missing a subject or have an entirely different meaning, then the fact that the test writers specifically mentioned the original phrasing as a possible answer is plausibly indicative of their intent. In sentences of the sort They say it's going to rain; They built another new mall near us; or They found that missing child, "they" is certainly a dummy since no one seriously expects a flesh and blood antecedent. I believe the SAT example sentence suffers from the same use of the dummy "they." The question itself asks for a better phrasing (if possible), not whether the example sentence has a grammar error. This is really more like a diction exercise than a grammar check. And for the record, wouldn't The passive voice is endorsed by The College Board have been more apt as the title? A they figuring out the color and taste from the floral source instead would be unusual. While what you say is possible, I disagree on two counts. First, this is, as I said, unusual, as a (present-day) context for the sentence. There are far more likely meanings. Second, who are you suggesting the they is? You ask us to “imagine the first scientists…,” but you use the word “theory” as the subject of determine, the verb in question. It is even more unusual as an interpretation to suspect that the they be a theory. I disagree that "they determine" would imply any conscious agency if it's referring to bees. What about the following: "Pay close attention to the pH and nutrient level in your soil. They determine the crop yield." Surely no one would claim this makes pH and nutrients into conscious agents. @army1987: Yes, that's why E is a better answer. I'm going to agree with Chris on this one. The math section you can get a perfect score on just by having the right knowledge of math. For the verbal section you have to have the right knowledge of language usage, and *also* have to sometimes guess the intentions of the quesiton writers. For a question like the one in this post, it is easy to guess the intention of the question writer, so the answer is easy to guess as E. But in some questions, there are genuinely more than one good answer, depending on the question writer's intent. I also don't have hard numbers, and don't even know where I'd find this particular statistic, but my guess would be that the variance between test scores among a single person who takes the test multiple times would be much higher in the verbal section than the math section. This is because the verbal section *requires* guesswork, so you get a statistical probability effect. An anecdote supporting this is my own scores. I took the SAT three times in six months near the end of high school (so my actual knowledge base did not change a lot in this time frame). In the math section I got 760, 770, and 800. In the verbal section I got 720, 770, and 630. (Also note that the 630 was on my third and final taking of the test, so it wasn't just the my knowledge was increasing more rapidly than I thought — it's just that my guesses about the writer's intentions were not as good that time). Keith M Ellis: Hm. Perhaps you're right. I am trained in the sciences (biology) so I may be biased here. I take issue with this. While it's true that the dispassionate passive was instilled as "sciency" through high school and college, once I was in the (relative) real world of journals and monographs I found that approach to be obsolete. Lay knowledge of the sciences is almost always at least 20 years behind. Back to the original SAT question. Despite what I just said, the passive voice is not actively discouraged in such context. So—just as in any field—good writing is good writing and depends on clarity and flow and, conversely, obfuscation and lack of flow (that's art and style too). Ambiguity is of course undesirable in science writing, as it's contrary to its goals. As others have mentioned, (E) is the obvious choice if we are to take the sentence on its own merits, as a standalone. Absent other imperatives (i.e., the "proposed" College Board disclaimer on the test) or imagining context, such as Mark Liberman's excellent hypothetical lead-in sentence in the post, one should look to achieve the simplest, clearest result. correction: I shouldn't have described the hypothetical lead-in sentence as 'excellent' for the reasons pointed out by other commenters. It does succeed in contextualizing the original sentence, but opens up a jar of bees about agency and intent. addendum: Steve Kass: I attended Drew from '87–'91. It seems to me the real problem here is multiple-choice tests. The sincere student with an inquiring mind, who is actually concerned with finding the "right" answer, will be more likely to see problems inherent in the forming of the questions, and will slow down to grapple with what's wrong with a question, and get frustrated. The bright cynical student, who sees the whole exercise as a crock, an obstacle to be gotten through, will quickly skim the question, and make an educated guess as to what the examiner wants. And when he gets to university he'll probably tell his professors what he thinks they want to hear, as well. Second, who are you suggesting the they is? You ask us to “imagine the first scientists…,” but you use the word “theory” as the subject of determine, the verb in question. It is even more unusual as an interpretation to suspect that the they be a theory. Yes, in my specific sentence, which is neither of the example sentences. With that context, the "they" in sentence A is "scientists". The scientists developed a theory. Students are far more likely to encounter a news article reporting this work than they are the original work. Which is to say, the scientists will be the subjects of the reportage. I am trained in the sciences (biology) so I may be biased here. …well, I have training in science, too..
First, this is, as I said, unusual, as a (present-day) context for the sentence. …though more in the history and philosophy of science. And perhaps that biases me in not assuming that any given sentence that is science-y must be referring to something contemporary. But in any case, I can imagine any number of contemporary contexts for "scientists" being "they". What makes California honey distinct from Brazilian honey? Really, why assume that everything there is to know about honey color and flavor as it relates to bee polination is already known? Of course any healthy person can readily assess the color and flavor of a given honey. How that relates to the facts of its production is another matter and, when investigated, would most likely be reported as the investigators having "determined the color and flavor of the honey by the flowers from which the nectar is taken", among other things. In sentences of the sort They say it's going to rain; They built another new mall near us; or They found that missing child, "they" is certainly a dummy since no one seriously expects a flesh and blood antecedent. I am honestly confounded by this. I mean, firstly, I misunderstood Ellen K's comment to mean by "dummy subject" that they didn't refer to an agent even implicitly. Because even in a passive construction with no "they" as the subject, the agent doing the "detemining" in the original/A case is necessarily a different agent than the one doing the "determining" in the E case. In E, the flowers are determinant, and in A an agent which isn't flowers is the determinant. The two complete sentences simply cannot have the same meanings. They built another new mall near us within a few months. Another new mall near us built traffic within a few months. I imagine you'll assert that this isn't comparable to the SAT question. But my point is that just because the verb built appears in both sentences doesn't mean that it has the same meaning in both sentences and this is indicated partly by the fact that the distinct subjects have a strong bearing on which meaning of "built" is appropriate. MYL, I was about to scold you for once again implying that the College Board designs its own tests, rather than blindly administering tests produced under contract by Educational Testing Service; but I see from Wikipedia that the College Board may actually have taken over production of the SAT, or hired it out to a different contractor, since the year I worked at ETS (2005). The Wikipedia articles on the College Board, the SAT, and ETS are all somewhat unclear on this point, and good luck trying to find anything informative on the College Board site. I want to make it clear that I'm not trying to defend the College Board (I hate them too), only to point out that most of your SAT-related criticism over the years has probably been pointed at the wrong target, and I'm surprised you never noticed. [(myl) You're wrong to suppose that I "hate" the College Board — on the contrary, I think that the kind of testing that it represents is an important and much-needed gesture in the direction of meritocracy and democratic access to education. And for the purposes of this post, I'm not even concerned with questions of how well such tests predict educational performance or lifetime success. My point is a very limited one: there exists an extensive and widely-taught set of folkloric prejudices about English grammar and usage, and perfectly reasonable questions in this area will be evaluated by many test-takers with reference to their experience of this body of ideology. This influence may distort their answers in ways that don't represent either what they actually know about writing or how they themselves would normally write. I wonder how many readers would have rejected (E) because their preferred verb form for that sentence is "is". No, this is not a trivial observation–the set of such "believers" is far from zero. @ShadowFox: Robert T McQuaid mentioned this in his comment. Personally, I don't think it's far-fetched that someone would understand "Honey's color and flavor" as "Honey's color and honey's flavor" as opposed to "Honey's (color and flavor)", per McQuaid's nice notation. I'm sure that there's some usage authority that asserts that it's definitively one way or the other. But I'm going to have to go the descriptivist route on this–I'd bet good money that many, many native speakers of English can be found using whichever verb, singular or plural. @Will: Leaving aside the current discussion about the writing section, I have never once seen a Reading question in which required you to guess anything. This is a common misconception about the test. Every correct answer is provably correct based on the information provided. Every wrong answer is demonstrably false based on the information provided. I have never encountered a Reading question that was ambiguous in its answer. Rather than having a list on the test, I think that they should just issue an SAT Grammar guide. Then, instead of testing students' knowledge of English Grammar, they can test knowledge of SAT Grammar, and any argument that the SAT answer is “wrong” based on English Grammar will be invalid. Basically what they're doing now, except more upfront about it. This use of “they” without an antecedent is ungrammatical. The fact that there are idioms allowing a dummy “they” doesn't mean that is generally acceptable. As for this stuff about worrying about the passive voice, I find it quite silly. Look at Orwell's take on it (this is in a list of things he objects to): “In addition, the passive voice is wherever possible used in preference to the active”. Is this a joke? Seriously, is it a joke? Did he do this intentionally? And what is the very first sentence of Strunk and White's /Elements of Style/? “This book is intended for use in English courses in which the practice of composition is combined with the study of literature.” Looking at the SAT instructions, if they were opposed to the passive voice, this would be an odd way of showing it. They had two passive voice constructions in the first sentence of the instructions! The problem is that you have some people who are wrong about grammar, and some that are wrong about what the SAT thinks about grammar. It's possible that someone might not find a problem with passive voice, but still think that they're supposed to say it's wrong for the test. I don't see how a plural noun phrase becomes singular simply by modifying it. Is “my mom and dad” singular or plural? I've been reading posts here about passive voice with interest. I now know that I don't really understand what "true" passive voice is, however, I think I know what most lay people think passive voice is. In any case, I'm curious to know your reaction to claims by literacy specialists that passive voice is harder to read/comprehend for low-literacy readers. I did a little looking around online and couldn't come up with research to support this claim, but as someone who writes "accessible" training material I can tell you that there is a pervasive belief within my field that passive voice is more difficult or confusing for low-literacy readers. Is the instruction "pick the best sentence" in this context SAT-speak for "pick the only one of these five options that's actually grammatical"? (I mean, assuming the correctness of the analysis that A is unacceptable when evaluated in isolation because of lack of a cleanly-specified antecedent for "they.") That seems like a funny use of the word "best" (parallel to an equally funny use of the word "better" elsewhere in the instructions). One might almost say a dishonest use. Don't the ordinary semantics of better and best imply the presence of at least two options that meet some minimum threshold of some salient quality of ok-ness? One issue I have with the construction of this question is that A doesn't sound to me like a sentence that anyone would actually produce in the situation where E is better. The authors of this question could have started with "They label honey, specifying its color and flavor, by the…" except that it would then be fine. The only way I could see A arising in a situation where E is intended is if the original author wrote something okay and then made it ungrammatical in the intended reading, and we're fixing it in a different way. On the other hand, my multiple-choice-test-taking skills eliminate A: B, C, and D are ungrammatical but are clearly supposed to mean the same thing that E does. A is only grammatical in a different reading. 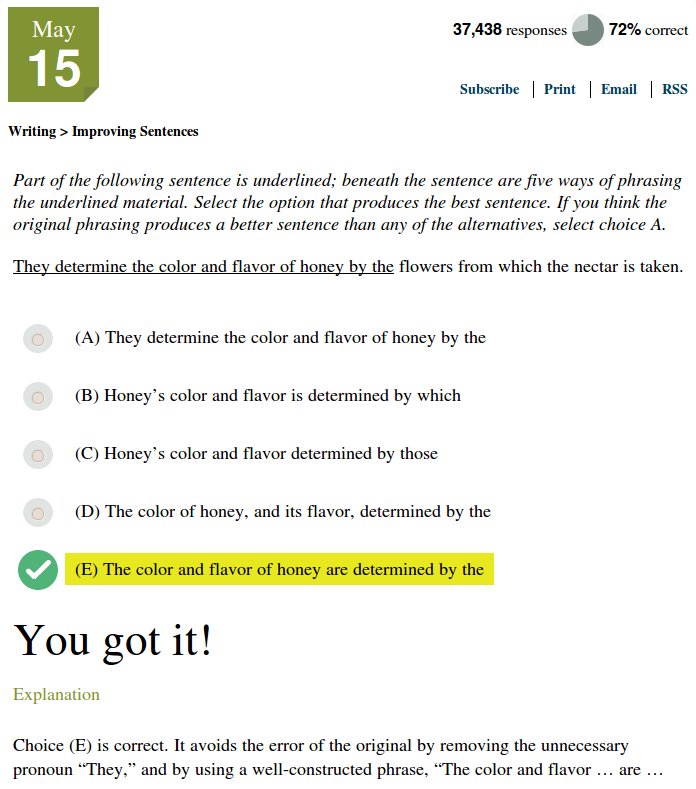 If A were right, none of the other answers would be at all close (imagine if A were "And bees provide a benefit to the…", with the correct answer obviously being A); since they actually have this on the test, the intended meaning must be the one that somebody might want all of these to have, and only E is grammatical on that reading. Though its early history is not fully known, origami, the art of folding objects out of paper without cutting, pasting, or decorating, [seems that it had developed from] the older art of folding cloth. Yes, but choice ( C ) likewise links the subject with an appropriate verb form, and its use of the passive ‘been developed’ is arguably more appropriate than the use of the inchoative ‘developed’ in choice (B) inasmuch as origami was a patient rather than an agent in the historical development the sentence describes. @ShadowFox: I’m not a dogmatic “believer” about it, but I do find is just as natural as are in that sentence. I think the reason is that semantically, I’m reading colour and flavour not as two distinct attributes of the honey, but as a single more complex attribute, perhaps by metonymy including also smell, texture etc. — rather analogous to look and feel, which is certainly treated as singular more often than plural. From its modest beginnings [as] a series of brief vignettes to [its establishment] as the longest-running prime-time animated series on television, The Simpsons [transformed] the way [both the] audiences and television programmers view the animated sitcom. But parallelism here requires only that ‘both’ and ‘and’ precede noun phrases, not that those noun phrases be similarly articulated. It’s surely possible that the writer is referring to particular audiences, on the one hand, but to the whole class of television programmers, on the other. Then again, it’s possible that the definite article has merely been ellipted before ‘television programmers,’ as, e.g., in “The Speaker of the House becomes President if both the President and Vice President die.” In any case, a student could and should be forgiven for judging the sentence error-free. The first 10,000 United States patents, known [to be] the X-patents, were burned in a fire in 1836. But if the intended expression is ‘known as’, then technically there should be quotation marks or italics applied to the expression ‘the X-patents’ to mark its metalinguistic reference. Option (B), on the other hand, yields a perfectly grammatical sentence that corrects the aspectual error of the original sentence without altering its basic meaning. MYL: First, a point of clarification. I didn't intend to suggest that you hate the College Board; I meant that I despise them as much as I despise my former employers, ETS. And I don't despise either one for the principles they represent, but for the shoddy way they're run, and the terrible way they treat employees and students alike. I have some direct experience of this, which is part of why I chose not to use my usual posting name for these comments (since it happens to be my real given name, and a moderately rare one — I don't want to attract their attention). Anyway, I apologize for the unintended ambiguity. As for the relationship between the two institutions: When I worked at ETS, we were told that ETS develops the SAT under contract for the College Board, and the College Board administers the test to students. If the comment by "Lilsby" on the discussion page for the Wikipedia article on the SAT is to be believed, that is still more or less the case, or was, as of March 2008. In any case, the impression I was given then and still have now is that ETS produces the few tests used by the College Board, in addition to a long list of others for its own use (such as TOEFL and TOEIC). Of course, College Board has endorsed the passive voice for years, by using it in the instructions! "Part of the following sentence is underlined"
The question is also muddled regarding the actual task we are being asked to undertake. We are first told to choose the alternative the produces the best sentence, a multi-wise comparison across all 5 alternatives. We are then told to choose option A if this option is better than any of the other alternatives, ie, a series of 4 pairwise comparisons. The best alternative across all 5 alternatives is not necessarily A even when A is judged to be better than each of the other 4 options in the sequence of pairwise comparisons. In marketing research, consumers often choose one common alternative when faced with a sequence of pairwise comparisons involving that option against others, and a different alternative when faced with a multi-wise comparison of all the same options together. @MH: in addition to myl's rebuttal, I don't think your example is passive voice. "X is Y" isn't a passive construction, is it? I don't have anything extra to add to this discussion apart from the fact that when I took the SAT Writing subject test in 1998 (in the old days before it was incorporated into the regular SAT I) I got a nearly perfect score without consulting any of the guidebooks. I also never read Strunk and White. I think my experience indicates that it's a fairly reliable test of one's intuitive grasp of regular-sounding formal English, which is what it's supposed to test. Test prep can help (I've taught it), but there's nothing better than repeated exposure to formal writing. I used to be enamored of Strunk and White until I read many of the posts here, and now realize that it isn't as good as I once thought it was. The part I like best about Strunk and White is (in my paraphrase, from memory): "Omit needless words! A sentence should have no unnecessary words, and a paragraph no unnecessary sentences, any more than a machine should have unnecessary parts." That helps in my own writing, when I tend to use too many words. Like cossacksare, I got a very good score on the English part of the PSAT and the ACT without any test prep. I don't remember if I took the SAT itself, but I might have. I loved the question where the winning answer was the passive sentence. Many do not even know what a passive sentence could be, and so they eschew opining. "A. They determine the color and the flavor by the flowers from which the nectar is taken." Some here argue that "color and flavor" may properly be considered singular. However, "color" and "flavor" are distinct, whether or not they are found together in honey. If you disagree, rephrase the sentence you just read with "is" instead of "are" and "it" instead of "they." One can taste without seeing, or see without tasting. A single sentence can stand alone in the real world; ETS has made quite clear that neither speculation nor divination is required. Perhaps ETS employs examples such as this to tempt test-takers to imagine a context. Imagination is not a prerequisite of grammaticality. The multiple-choice portion of the writing section requires only knowledge of some selected rules of grammar and vocabulary sufficient to discern the meaning of the words in the sentences, in the context provided. The SAT does not require knowledge of science, nor the practice of keeping bees. Any pronoun in a sentence must refer to something specific in the sentence, because there are no other sentences. The only context one can properly infer is contained within the sentence itself. The meaning of answer choice A is unclear. "They" could refer to color and flavor, or flowers, or some combination of the three. "They," in this example, is an ambiguous pronoun. One poster suggests "they" must refer to "some people." Sometimes it does. But "they" is always the plural form of "he", "she" or "it," or some combination thereof. "They" could refer to colors, flavors, or flowers. The answer choice is flawed because it's impossible to determine the subject of the sentence. Some posters claimed that the verbal sections require guesswork. I disagree. While ETS has been involved in many lawsuits, I don't recall any instance in which ETS lost a suit concerning a question with two correct answers, or no correct answer. While I bemoan the current interpretation of student data derived from the SAT for use in the admissions process, this example does not demonstrate a flaw in the SAT. The author's investigation ought to begin with the question, "What does the SAT measure?" PS – The word "grammaticality" does not appear to be recognized by the dictionary of this comments section. Ironical!